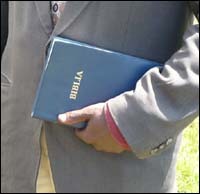 When I was at the African Renewal Leaders Conference in Eldoret, Kenya, September 26-30, 2007, I was shocked to learn that many of the pastors and leaders who attended the conference didn't have a Bible! I can't imagine trying to pastor and teach without a Bible. These pastors rely on listening to American televangelists and then communicating these messages to their flock. But they have no Bible of their own to nourish their souls and to speak with authority from God's Holy Word. I purchased 60 Bibles for pastors during the conference, knowing that you wouldn't want me to let this opportunity pass without responding. And many of you have helped with this project. What a privilege to put Bibles into the hands of pastors and leaders, who can now teach from the authoritative Word of God, rather than someone else's interpretation. Praise the Lord!